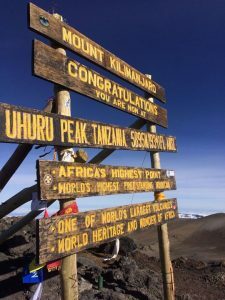 Join us to the summit of Africa – Uhuru Peak 5895m in 2019! Join us on our 11 day trekking expedition to the famous summit of Kilimanjaro; truly the trip of a lifetime. The trek itself is 7 days with 2/3 days travelling (dependant flight times) and covers a variety of terrain under foot; from dry moorland, Rainforest to Arctic like conditions. You will be guided by experienced International Mountain Leaders with years of experience leading and guiding all over the world. As part of the trek all equipment will be carried by local porters, so you will only need to carry a daysack. Camp will be set up prior to your arrival each day and you will be provided with hot meals and water. Our route is via the Machame route which is strenuous at some points, but not technical, so no mountain climbing experience is necessary. Please see our Facebook page – Aspire2Summit for previous expeditions and further information about this trip or contact us via email.